He is the only person I can think of who has all of those attributes, so as I've thought about who might have a real shot at Saxby, Jim Martin is the name that keeps coming to mind. When Jim ran for Lt. Governor in 2006, he was well-known in the metro-Atlanta area, but not as well-known statewide. He had a tough race, in a tough year, but in the process, he developed substantial positive name ID and garnered more votes than any other non-incumbent democrat who ran state-wide. He is well-loved by Georgia democrats. Wouldn't you love to see a debate on SCHIP between Jim and Saxby? Jim would be able to credibly challenge Saxby on health care, corruption and national security. And, if Jim ran, he would lift every other democrat on the ticket. 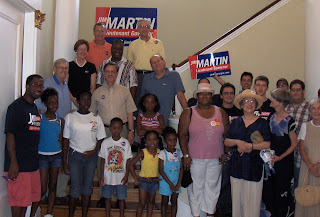 So, that's my Christmas wish-that Jim Martin would run for senate. Martin is all class...quite the opposite of the leading current Dem candidate (VJ). That's right. Well said. He is, in fact, all class, and we would be very lucky to have him on the ticket. We can always hope. Maybe we need to "Draft Jim!" And, by the way, there is no question that Jim is tough-in all the right ways-enough to win. In a year when democrats are likely to do well, he is the kind of democrat who has across party line appeal. People tend to under-estimate Jim. Lot's of folks gave him little chance of winning the democratic primary for Lt. Gov., but look what happened. I think he would make a tough challenger for Saxby. And if he doesn't run...maybe Amy can! Thanks, but no. You might've noticed that I lack a fair number of things on that list, not the least of which is critical statewide name recognition. But, I'll take this as a compliment. did i take that picture?